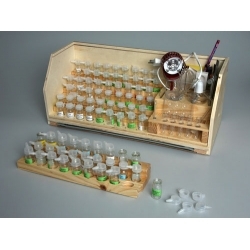 Chemical analysis-basics kit The set provides for carrying out laboratory experiences and practical lessons. 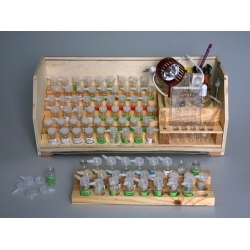 The set contains the following equipment and accessories: Base support with a transparent cover for small-sized lab ware, utensils, details and units. 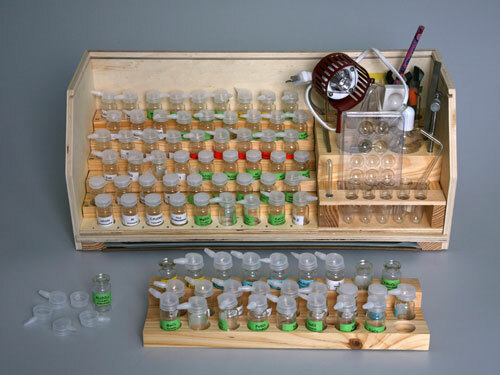 The complete set of bottles in volume of 10 ml for storage not less than 75 chemical substances in the form of solutions, powders and the granules, the set must be provided with labels. Electro heater for test tubes capacity 20 В•А, voltage 42 V, with an opportunity of heating test tubes in inclined positions. Laboratory spirit-lamp capacity no more than 30 ml. Set of heat-resistant test tubes. Micro -metering device for solutions of substances, not less than 50 pieces. Planchette for fulfilling 12 drop reactions simultaneously. The equipment and accessories should be fixed or installed on the base-support in the fixed position. 4) Double layer case 1 pc. 5) Single layer case 1 pc. 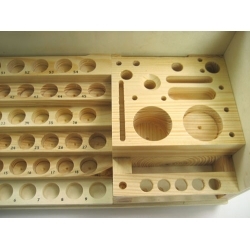 6) Item holder base 1 pc. 7) Labeling set 1 pc. 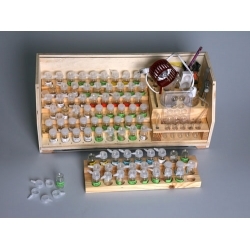 8) Pipette cap 54 pcs. 9) Stopper with cutter 15 pcs. 10) Polyethylene stopper 7 pcs. 11) Stopper with holder 1 pc. 12) Bottle 10 mI 76 pcs. 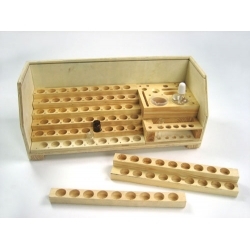 13) Laboratory hopper 1 pc. 14) Low form glass beaker 50 ml with lip 1 pc. 15) Glass beaker 50 ml 1 pc. 16) Spirit lamp (small) 1 pc. 17) Measuring cylinder with lip 50 ml 1 pc. 18) Glass stirring rod 1 pc. 19) Test tube 5 pcs. 20) Test tube heater 1 pc. 21) Evaporating dish 1 pc. 22) Mapping board 1 pc. 23) Carrying object glass plate 1 pc. 24) Chroma key flat 1 pc. 25) Bleeding tube with cork 1 pc. 26) Connective tube with cork 1 pc. 27) Glass tip 1 pc. 30) Dissected ring 1 pc. 31) Clamp of metallic tripod 1 pc. 32) Connecting collar 1 pc. 33) Core of metallic tripod 1 pc. 34) Paper filter 5 pcs. 35) Copper screw 1 pc. 36) Match box 1 pc.